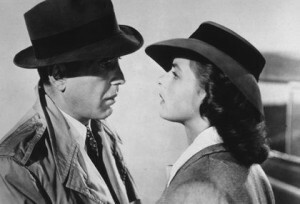 This post about the movie Casablanca is a deviation post still strongly linked to old Shanghai. The 1942 movie takes place during World War II in Europe when Jewish refugees from Central Europe were fleeing persecutions in their home countries, selling all their belongings to try and reach a safe heaven. Casablanca was a transit port for a flight to neutral Portugal and then boarding a ship to the USA. However, obtaining the permit to leave was very difficult and many just stayed in Casablanca surviving on the last money they had. There is a strong similarity with Shanghai during the same period where about 28.000 Jewish refugees arrived from 1937 to 1941. Shanghai was also supposed to be only a transit point before going to North America or Australia. However, many had to stay in Shanghai until the early 1950’s. While the most wealthy rented an apartment in the French Concession, many where housed in Hong Kou district, in the area that later became the Jewish area under Japanese control. When they reached Shanghai, the foreign settlement and the French concession were already surrounded by the Japanese army that had invaded the Chinese town. Refugees where flooding into theses foreign areas and just like in Casablanca, many foreigners where trying to find a way to escape the trap that was closing up on then. There was a many bars in old Shanghai and I am sure some of them had an atmosphere and tension similar to the one one of “Rick’s Cafe Americain” in Casablanca. I often think about the Del Monte and other Hungaria Cafe when I watch the movie Casablanca as I am sure the feeling of anxiety of people trying to escape Shanghai and the atmosphere of desperate enjoyment must have been the same. The final link between old Shanghai and the Casablanca is the period atmosphere. Same fashion had people in both places wearing trench coats and hats, very much the dress of the late 1930’s and 1940’s. I love this kind of dress though I don’t wear in often. 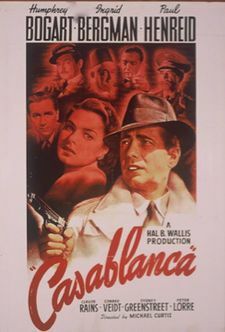 The genre of black & white movies from the period is called “Film Noir” and Casablanca is clearly a chef d’oeuvre of the genre, along with the Maltese Falcon (also with Humphrey Bogart), detective stories like Raymond Chandler’s Marlow and others. I often think about old Shanghai as a a very wet version of a film noir with the gangsters, the tension, the adventurers all in 1930’s cloth. There has been a few movies about old Shanghai (like Tian Tang Kou that I really like), but really gets anywhere near the real film noir, though Shanghai, the movie with John Cussack and Gong Li gets pretty near. That’s an interesting question. I have also wondered about that. I will try to look more into that and ask people who know more about that.